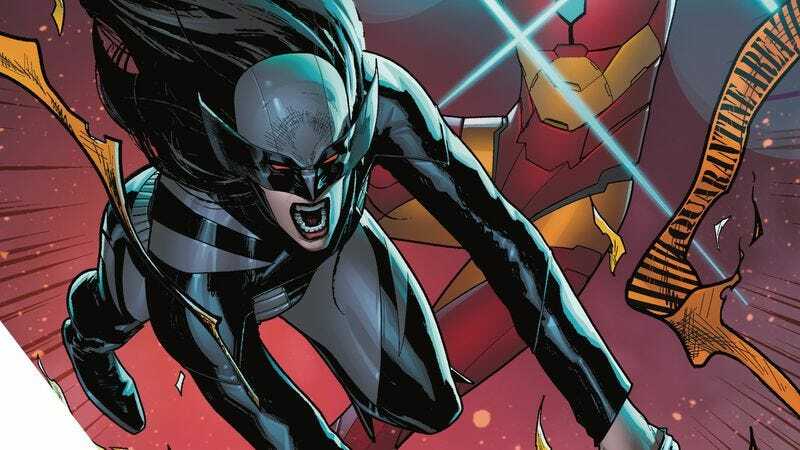 Tom Taylor’s run on All-New Wolverine has been incredibly fun while maintaining high emotional stakes, and Taylor has brought a lot of depth to Laura Kinney’s character by exploring her tragic past and her present-day need to be more than the killer she was created to be. So much of Laura’s life has been defined by her ability to inflict pain, but in this latest arc, she’s discovered a new ability that allows her to transfer her healing factor to others. It’s a very handy power given that an alien virus has broken out on Roosevelt Island, and Wolverine is the only person with the key to stopping its spread. Taylor has also spent a lot of time making Laura a more prominent presence in the Marvel Universe, and this current storyline features a slew of guest stars, like Ironheart, Spider-Man, Mockingbird, Hulk, Wasp, Dr. Strange and Beast, most of whom are appearing in their civilian identities to help Wolverine respond to the crisis. All-New Wolverine welcomed a new art team as part of the RessurXion event, and penciller Leonard Kirk and inker Cory Hamscher (with assists from Marc Deering and Terry Pallot) have brought a lot of intensity to this contagion story. This exclusive preview of next week’s All-New Wolverine #21 is light on action, but it shows how well this art team reinforces the emotions of the script, particularly the desperation and fear of the infected and Laura’s shift from shocked to determined. The first panel of the second page is a very effective moment that relies entirely on Laura’s body language as she prepares to walk out into a crowd of diseased people, and her posture and the positioning of her hands indicate that she’s taken aback by the size of the throng. The afflicted are initially colored with a sickly pale palette by colorist Michael Garland, but as Laura makes her way through the crowd with Ironheart, refreshing blue washes over them before a final burst of red, suggesting that this mob may turn violent as people rush Laura in hopes of being healed. Image: Marvel Comics; cover by Leinil Francis Yu and Romulo Fajardo, Jr.